Yesterday was a really hectic 10-hour trading session where I was seduced into daytrading QQQ options, quite enjoyable, frenetic, and profitable, but I had to focus 100% on it. SPX backed off the earl highs, you may say it tested the 200ma, just 2 points away from the SPX high, and then buyers' remorse set in. There were a few more attempts at rallying but indecision (and fear?) prevailed for most of the afternoon hours. 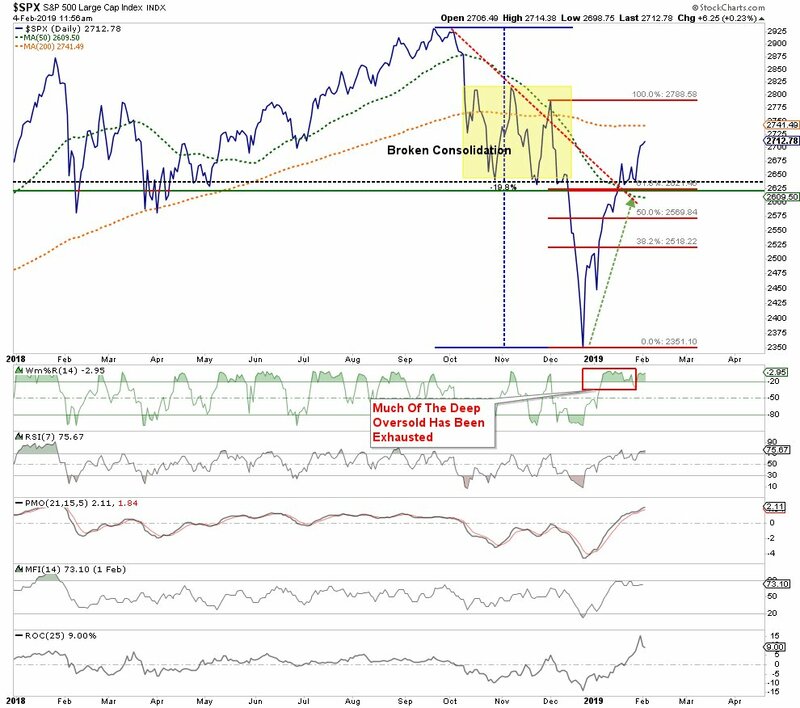 So, here we are at this critical point in the market, ST & IT long, no doubt about that, but a market that seems to be either resting/consolidating or unable to go higher because of lack of buyers' motivation. A quick resolution of the shutdown issue can provide a 3 to 5 % rally, good trade negotiations can also do that, but the markets now seem to be running out of catalysts to take it much higher. In such an environment, minor bad news can send it lower. In my decades of experience, I have observed it is the reaction after the first 1 to 2% pullback that will determine the the next major market move. Of course, you may never get a 1 to 2% pullback until the market reaches a new record high! 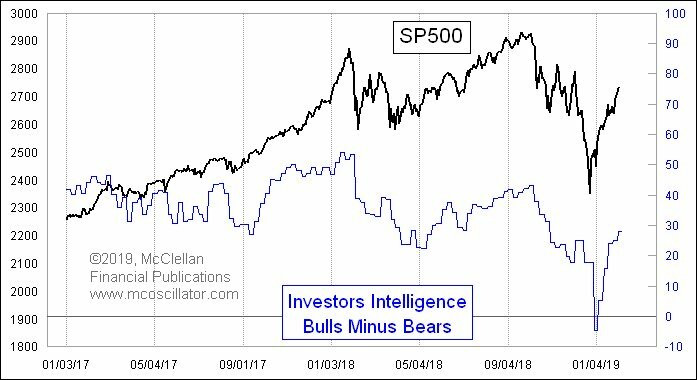 Because the S&P500 is now so overbought – the highest RSI since the market top – the risk of another facial from a short position is limited, in our opinion. Waiting for the 200-day to be penetrated, then setting a short limit order just a few points below the 200-day, right around today’s close. Two or three green candle closes above the 200-day sets the index up to challenge the December high and key Fibo at 2800. Whoops, we were wrong again. As always we do reserve the right to be wrong, as we, or you, or anyone else, don’t know jack scheisse about the future. 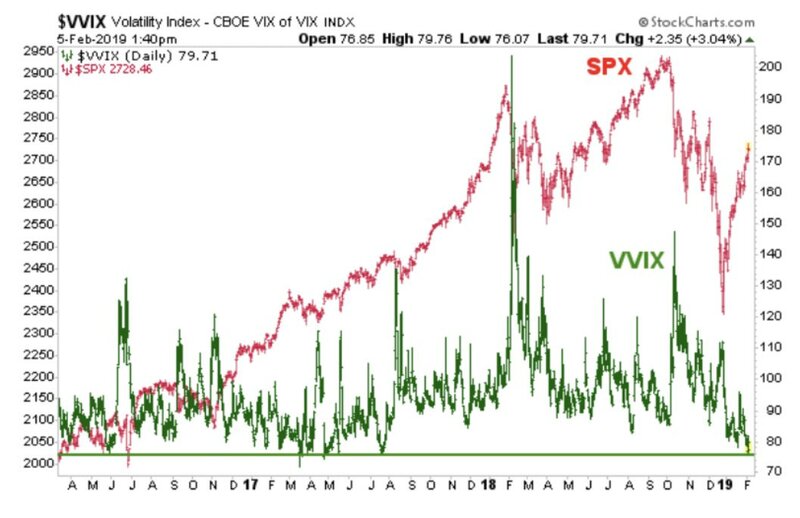 While the $VIX tests 4 month lows, the $VVIX (Vol of Vol) has dropped to levels not seen since July 2017... during one of the calmest equity markets in history. My hourly VIX buy has been triggered several times during the previous 25 trading days but the daily has not. It could do so this week. I couldn't begin to explain this in a single tweet, but the expectations for $VIX (based on $VVIX, the VIX of VIX) have crashed at a record pace. VIX options players are expecting LITERALLY half the VIX they were just 30 trading days ago. That's never happened before. The Recession word is getting louder. 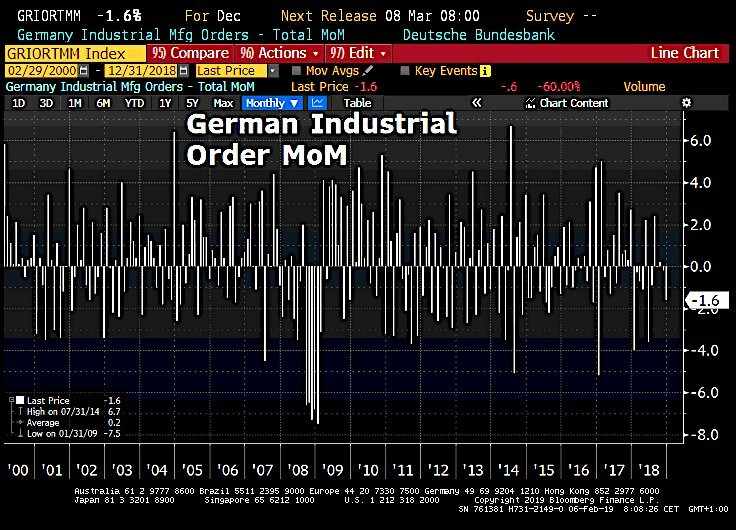 #Germany's Industrial Order dropped 1.6% in Dec m/m vs a gain of +0.3% expected. Capital goods orders fall 2.5% m/m. 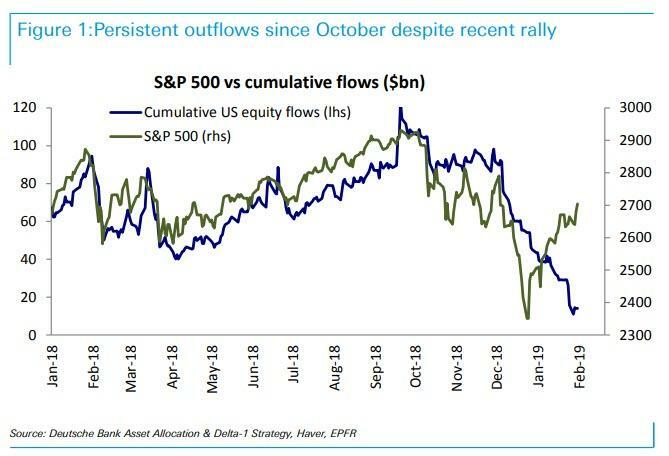 What drives investor sentiment? People see what has happened, and they change their minds accordingly. When sentiment gets to an extreme, it is usually because what prices have just done is at an extreme. Edited by dTraderB, 06 February 2019 - 07:31 AM. The U.S. trade deficit for November, released at 8:30 a.m. ET, is expected to narrow to $54.3 billion from $55.49 billion the prior month. U.S. labor productivity in the fourth quarter, also due at 8:30 a.m., is expected to rise at a 1.6% pace, a slowdown from the prior quarter's 2.3%. Unit labor costs are expected to increase 1.7%. Crude-oil stockpiles are out at 10:30 a.m. and expected to have advanced by 1.4 million barrels during the week ended Feb. 1, according to the average forecast of 11 analysts and traders surveyed by the Journal. Fed Vice Chairman Randal Quarles speaks at a stress-testing conference at 6:05 p.m., and Chairman Jerome Powell participates in a town hall at 7 p.m.